Protracted land disputes in western Côte d'Ivoire have driven some residents to occupy protected government forests, contributing to extensive deforestation and leaving just a fraction of the forest cover that existed at independence. Now, authorities are moving to expel forest residents, heightening tensions in the country’s most volatile provinces. The breakdown of law during Côte d'Ivoire’s conflict years, from 2002 to 2007, and more recently the 2010-2011 post-election violence, also contributed to forest degradation by allowing indiscriminate illegal logging and forest occupation. The waves of conflict forced hundreds of thousands from their homes, which, in western Côte d'Ivoire, the country’s most agriculturally rich region, exacerbated land disputes. Land left behind by fleeing families was often occupied, rented or illegally sold by others; to avoid land conflicts, some returnees settled in protected forests. “Other than immigrant populations who have settled in the protected forests to avoid land conflicts, local residents who returned from refuge and need to farm have also settled in the forests. All these people have become a threat for the protected forests,” Frédéric Varlet, an agronomist based in the country’s commercial capital Abidjan, told IRIN. He explained that people continue to settle in government forests because communal land laws do not apply in those areas. The government in 1998 passed a rural land law aiming to recognize and formalize customary land rights by setting out procedures and conditions for them to be transformed into title deeds. But most land agreements are still predominantly verbal, a matter that has contributed to the recurrent disputes. “When I returned from [refuge in] Liberia eight months ago I found my farm had been occupied by someone else who refused to leave despite the intervention of the deputy prefect. I have since settled in a protected forest, where I cleared two hectares to cultivate rice,” said Germain Gueu, a farmer in Bangolo area. In the 1960s, Côte d'Ivoire had 16 million hectares of forest. By 2010, only three million hectares remained, according to the state-run Forest Development Organization (SODEFOR). Over the last decade, the country has been losing 300,000 hectares of forest every year, said Marcel Yao, who is in charge of the country’s climate change programme. Agronomist Varlet said that forest occupation dates back to the 1960s. Côte d’Ivoire’s cocoa boom after independence drew workers from around its western region and neighbouring countries. “The country’s development relied upon labour provided by foreigners who settled in these forests,” he noted. Weak law enforcement and complicity by authorities and local residents led to the severe forest degradation and added to long-standing land disputes in western Côte d'Ivoire. Land conflicts, mainly driven by political manipulation, have pitted native residents of western Côte d'Ivoire against immigrant communities from the country’s north and from neighbouring countries. “During Côte d’Ivoire’s decade-long crisis, the government often did not exercise full control of the country, and the focus was largely on the politico-military stalemate,” said Matt Wells, a researcher with Human Rights Watch (HRW). “But the occupation and destruction of protected forests over the last 10 years has not simply been a result of government inaction or ineffectiveness. At times, state actors have been directly involved in the occupation of protected forests, exchanging access to these areas for financial or political reward,” he told IRIN. Land ownership disputes in Côte d’Ivoire’s west are largely unresolved. The 2010-2011 post-election violence deepened ethnic and political rivalries, causing deaths, displacements and loss of property such as land. [Cote d'Ivoire] This truck is carrying wood, marked with official stamp. 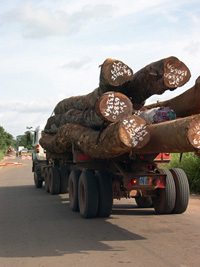 But in many of Cote d'Ivoire's forests illegal logging is continuing apace. The Guéré ethnic group, which is considered native to the country’s western region, supported ousted president Laurent Gbagbo during the disputed 2010 polls. When forces backing then opposition candidate and now President Alassane Ouattara launched attacks in the west, many Guéré fled. As they slowly return, many are finding that their land has been seized by those considered non-natives of the west, HRW said in report in October. A November government investigation on forest occupation of Mont Péko, western Côte d’Ivoire’s largest protected forest, showed that there were 6,715 families living there, 54 percent of them Ivoirians and the rest of Burkina Faso origin. In total, some 13,000 of Mont Péko’s 34,000 hectares are illegally occupied, the report said. It called for the creation of a panel to formulate a plan to resolve the illegal forest settlements and look into its impact on social cohesion, loss of cash crops, children’s education as well as issues of voluntary departure. There are around 20 government forests in western Côte d’Ivoire. Over the years, entire villages have sprung up in those forests, with the settlers clearing them for cultivation of cocoa and other crops. Authorities in June began evicting people from various government forests in the southeastern Niégré region, but the operation raised accusations by rights groups of theft, property destruction and violence by security forces. “What is certain is that illegal forest settlers will all be evicted by 2015. Cocoa, coffee and other plantations will be replanted with trees,” SODEFOR director Mamadou Sangaré said. “Any future evictions will need to be better planned and overseen to avoid such abuses. The government also needs to prepare for the potential spill-over effects in terms of land conflict,” said HRW’s Wells. Wadja Egnankou, the head of Ivoirian NGO SOS Forests, said that the evictions should be done in a manner that avoids creating tensions, suggesting that new settlers and those who have occupied the forests for less than three years should be evicted. “Destroying illegal plantations in protected forests would impact government revenue. Getting rid of these plantations equates to depriving this segment of the population their daily bread, yet inaction will lead to the total disappearance of Ivoirian forests. This is the dilemma Ivoirian authorities have faced in the recent years,” said Fabrice Kablan, an agricultural engineer.